An MRIP Calm? Or Regulatory Catastrophe..
10 Hour Sea Bass Trips: Friday, November 30 - Monday, December 3rd - & Thursday, December 6th - A New Set Of Trips Will Come Out Next Week. 12 hour trips depart 5:00 am for $195.00 ..
Clients arriving late will see the west end of an east bound boat. With a limited number of reserved spots, I do not refund because you over-slept or had a flat.. If I cancel for weather, refunds/reschedules are standard. 23,415 Reef Blocks deployed at numerous sites as of 10/18/18. Here are sites currently being targeted: Capt. Jack Kaeufer's Reef 571 - Doug Ake's Reef 3,721 - St. Ann's 2,234 - Sue's Block Drop 637 - Two-Tanks Reef 288 - Capt. Bob's Inshore Block Drop 843 - Benelli Reef 746 - Capt. Bob's Bass Grounds Reef 1,218 - Wolf & Daughters Reef 688. MRIP = Marine Recreational Information Program = Recreational Catch Estimates. It's how NOAA decides what we recreational fishers have taken from our bays & ocean..
Sea bass fishing has been very consistent this fall. However, if these winds keep on blowing, someone's going to have to call me a Waaaa-mbulance! Have been posting to FaceBook quite often leaving the task of an informative email backseated as other tasks, maintenance tasks, are attended to. Look up Morning Star Fishing on FB and you'll see the blow by blow of recent catches. Lots & lots of limits.. Every once in a while I get my head handed to me too. Still: Had one client limited & several in double digits on my worst trip lately..
And then there were spiny dogfish. They haven't been too much of a pest in recent sea bass seasons - are now. Sometimes have to pick up and leave em. Used to be that would happen with bluefish first. Sometimes bluefish were fun, other trips they'd be so dang thick you COULD NOT wind in a legal sea bass..
Bring up a sea bass gill plate and set of eyes..
Not going to catch blues every trip, and certainly haven't had blues remotely thick enough to be an issue, but we are starting to see them -- Blues showing up after dogfish have arrived is unusual..
(And, going back 5 weeks here! This is NOT going to happen again any time soon - as in "For Years" - I'd never experienced it before!) I had a sea bass trip in mid/lateish October where Fluke were a pain in my neck! I moved 7 different times trying to Get Away from flounder! Honestly! Now, some thought this a truly wonderful problem - and, I suppose, as 'problems' in life go, it can't get much better. I had Advertised a 'sea bass trip' - it was 'sea bass only' in the fish pool.. Finally ended up w/one angler at 14 sea bass - one short a limit. Lots & lots of guys limited on fluke that day..
Email Shocker: NOAA's taking some very bad guesses at what we recreational fishers catch. But it's a big deal where our quotas are concerned. It's these constant and forever over-estimates by MRIP that have lead to ever stricter regulation. So far as sea bass go, we're fortunate to have great managers battling for us along DelMarVa. All states above DE Bay have more restrictive regs. New Jersey is down to just 2 cbass in high summer. MA, RI, CT, & NY all have 15 inch size limits & small bag limits.. We're still at 15 fish at 12.5 inches. Truth is, while we have had managers who isolated us from MRIP's madness up north, we're simply lucky we've not had an MRIP recreational catch estimate along DelMarVa showing insane levels of catch that absolutely no one should believe ..It just doesn't matter to NOAA - unbelieved estimates get ground through the system anyway as "Recreational Overfishing." NY's Nov/Dec Private Boat sea bass harvest in 2016 & 2017 jumped from well below 100,000 pounds to about 3 Million lbs.. That's WAY MORE for just NY's Private Boats THIS TIME OF YEAR than ALL PARTY CHARTER BOATS FROM FLORIDA TO MAINE CAUGHT ALL YEAR! That's 2.7 million more pounds of JUST Private Boat catch, In JUST one state, in two REALLY COLD MONTHS than for All Party/Charter along the whole east coast ALL YEAR. NOAA does.. They "Have To" they say.. Fisheries law says NOAA has to use "The Best Scientific Information Available." Because MRIP's estimates are all there is - they use them. And that, dear reader, is how our recreational sea bass quota disappears. Nobody believes NY's Private Boat guys caught that. No one. But when Council is discussing recreational harvest - those numbers are folded right in. Accused & convicted of overfishing via statistic - NY's recreational fishers had to fight like crazy to keep just 7 sea bass at 15 inches from Sept to December in 2018. Pretty sure I know what would happen to my trips with a limit like that..
Every couple trips I see a private boat or two this time of year. A hundred fifty miles north, & that much colder, NY's incredible Private Boat sea bass estimate in 2017 is oddly counterbalanced with MRIP showing NY Party/Charter catching just 25,000 pounds of Nov/Dec sea bass. While Private Boats caught almost exactly 3 million pounds in Nov/Dec 2017 - All NY Party/Charter took just 25K lbs..
Really? This time of year I carry a LOT of boat owners who have (wisely!) winterized their boats. The private boat fleet is largely in storage. Oh sure, some guys are ready - waiting. Looking forward to the winter striper run especially. But the parking lot behind my boat is getting FULL of boats - all sitting "On The Hard" as some like to say. Forcing Bad Statistics into our system of recreational regulation make good science & management impossible. "Overfishing" rears its head Every Year! We're forever going past our allotted quotas.. NOAA makes everyone in system use 'The Best Available Data' - period. Because MRIP is NOAA's recreational catch estimating darling, results will be what they are so long as NOAA's "Must Use MRIP" remains policy - And because management MUST act to PREVENT "overfishing" - for we rec fishers MRIP creates a bad regulatory result - management is always having to further reduce our catch with tighter regs.. The National Academy of Science glows with pride; MRIP issues press release after press release telling managers how great they're doing. Have a look. This is a tiny fraction of what I see in MRIP - and just for one species! In the summer of 2000 MRIP says NJ Shore anglers landed just over 200K sea bass. They weighed 5 to a pound. (no bag limit then, just an 11 inch size limit as memory serves. Maybe 10. Wasn't 12 yet.) From that year, 2000, until last summer, 2017, no other sea bass were reported from the NJ Shore -- no NJ sea bass taken from shore at all between 2000 & 2017. But this summer, in 2018, NJ—whose anglers were allowed just two sea bass at 12.5 inches in high summer—is said to have averaged 1.7 pound keepers from shore. That didn't happen. It's never happened. It was only 15,500 sea bass. Not enough to disrupt our regulatory flow. But the MRIP system let it though. Still, those 15K cbass from shore become 26,371 lbs. This is more than MRIP shows for All NJ Party Boats in the same period. It's more than half of what All Party Boats are estimated to have caught throughout the entire Mid-Atlantic region in high summer. Many of us are targeting sea bass in summer. I'm pretty sure NJ's dedicated jetty fishers would have been having a time reporting that many "1.7 Pound Average" sea bass from shore. It's interesting too that 1.7 pounds is half a pound higher than any of NJ's boat caught fish. Though some Shore anglers are certainly skilled beyond belief, there's just no way NJ Shore anglers could land larger keepers than skilled Party/Charter or Private Boat skippers. It's not how the fish behave. Back in Sept/Oct 2016 MRIP claimed Maryland had 129,000 sea bass from Shore averaging 1.4 pounds. That's equal to several years worth of MD Party/Charter catch. 178,000 pounds of sea bass from shore - in the internet era - and I could only find one guy, a fellow who fishes down by the inlet frequently; one man who claimed to have caught a legal sea bass. One. Takes a couple inches beyond our 12.5 inch size limit to make a sea bass 1.4 pounds. There were no 1.4 pound sea bass caught from shore. In May/June of this year, 2018, there was really only Massachusetts' big spike in Private Boat landings. According to MRIP data NOAA will force managers to use: Just MA's Private Boats, as is so common in MRIP, landed more sea bass during those weeks of open spring season, about 1.5 million MORE pounds, than All Party/Charter Boats in the Mid & North Atlantic will catch all year - All Combined. MA catches over a million and a half more pounds than ALL of last year's For-Hire total..
MRIP's July/Aug 2018 numbers are out now too. They show NY Party/Charter catching just 4.8% of that state's sea bass. RI For Hire had 5.3% - CT 3.5% - DE 3%.. I've written numerous times about how a method of testing MRIP's accuracy could be devised by generating "Percentages of the Fishery" -- what For-Hire and sharp Private Boat skippers think is a fair division of actual catch based on "While Out Fishing Observation." Wherever MRIP is wildly divergent from what skilled anglers perceive as a reasonable percentage calculation; closer scrutiny might call for tossing the number------Or At Least Figuring Out WHY It's So Messed Up! Professionals have to turn in catch reports daily. Not that MRIP doesn't botch it, but being too far off when We Tell Them What We Caught is inexcusable. In fact, I believe a BETTER ESTIMATE for some fisheries could be devised using "percentage of the catch" alone. For Instance: Maryland's For-Hire summer sea bass catch shows 11,000 pounds. MD's summer Private Boat catch estimate in 2018 is zero. Rather than plugging a zero into the system, I think a sit down with fishers actually engaged in the sea bass fishery would show Private Boats catching approximately 20% of our total sea bass landings. Here MD's Private Boat landings would now become 2,200 pounds. In NY one skipper recently told me he thought Party/Charter responsible for 60% of that state's sea bass landings. Because NY For-Hire landed 41,574 lbs of sea bass in MRIP estimate; by using percentage of the fishery calculation Private Boats would show 24,944 lbs.. Instead, NY's Private Boats show 825,000 pounds of summer sea bass -- this while anglers were allowed just three fish at 15 inches. Yes, the number we turn in would have to be examined. And many skippers would have to be consulted - not just one - but a reasonable percentage division could be found..
MRIP has NY For-Hire at 4.8% of the summer sea bass landings. Boy, do I doubt that. No NY skipper I've ever spoken with thought Party/Charter catch was less than 50% in sea bass. Fisheries are being stolen by bad data. We really need to fix it. I've watched fairly closely since 1998. Instead of even minutely better, every repair to recreational catch estimates since 2005 has made the system worse. Quota disappears in an electronic puff of bad data. Shorter seasons/closed seasons/smaller bag limits/longer minimum sizes -- bad data has the helm. We MUST find a way to allow management to call Bad Statistics! Bad Science! Better still -- instead of just allowing managers to unglue obviously bad estimates, we ought to also bring MRIP back to earth. Who could guess how many millions of dollars have been lost in the recreational fisheries owing MRIP's bad data - let alone the money squandered creating that data. Fish do not fall from the sky. They are a product of habitat. Quota, however, can be sopped-up - completely spent - in a few bad estimates. Would that NOAA might begin to consider the Mid-Atlantic seafloor's remaining hardbottoms & examine their diminishment over time -- from the period immediately after WWII especially. It remains true that there were more sea bass caught and sold by the pound from 1950 to 1961 than in all the years since combined. That's a lot of fish. A huge difference. Delve into that -- there's where "Fisheries Restoration" will stem from. Choking off commerce through ever-tightening catch restriction -- by using data no one believes to create an aura of "overfishing" that's simply Not True -- could fairly be said the opposite. "Fishery," of course. includes the human-use side of a fish population. Shall we settle for whatever population can be mustered via regulations' diminished catch? Or ought we look to the facts of Fisheries Production to discover how in the world sea bass were once so much more prolific.. I tell all who will read: Reef Restoration Makes Fisheries Restorations More Simple! 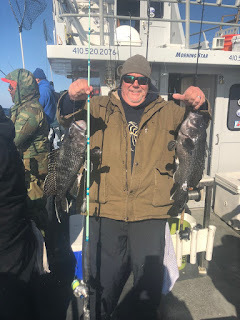 I witnessed, and my clients very much enjoyed, a wonderful increase in sea bass population when there was still no bag limit at all and the size limit was 9, 10, & 11 inches. Anglers this time of year would often box up over 100 sea bass -- even 200 sometimes! Know this from that era - the following year there'd be more sea bass in spring than in the previous year.. In 2001 I wrote a piece about the expansion of natural hardbottom habitats from 12 to 30 miles off our coast as summer flounder trawl quota was unfathomably low -- no one was dragging those hardbottoms - they regrew where a hard substrate remained. Cbass were flourishing on those bottoms, and Production, Spawning Production! - was in full gear.. I now believe the story of that population is far more complex - and far more difficult to convince managers of. It turns out that all sea bass scientific papers from before 2000 show sea bass beginning to spawn by age one - 9 inches or less. Sometimes they'd even spawn in their first year of life - what science calls "age zero." I've chronicled sea bass "age at maturity" shifting to age three (even 4) for many years now. Have written about it extensively. Understanding why the sea bass fishery remained viable in the era of NO regulation, then positively flourished under light regulation - and is now idling along at perhaps 15 to 20 percent of 2001's spawning production - requires we understand regulation's ability to alter spawning biology. Or, as NOAA is certainly doing today, claim a restoration victory based on recreational catch restriction -- and these ever-tighter restrictions based on illusions of catch that never happened. In a couple months we'll see whether MRIP's one arm bandit style of estimating catch will allow regulators to loosen, or force managers to restrict yet again. We'll be no closer to the truth of fisheries restorations' factual needs - and we'll witness, again, recreational estimates no one believes cartwheel regulation off in new directions.